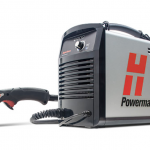 The small size and light weight of the new Powermax30® AIR, with an internal compressor, make it a highly portable system enabling metal cutting just about anywhere there is single phase power. Simply plug it in, attach the work clamp and you are ready to cut. The internal compressor eliminates the need for an external air compressor and filter to operate the plasma system. The fast cutting speeds and superior cut quality of Powermax plasma enable you to finish jobs quicker.